Remembering Mandolin Hero U. Srinivas The gifted Indian musician died Sept. 19 at just 45. Hear his music and celebrate his unlikely achievement — bringing a Western instrument into the heart of South Indian classical music. 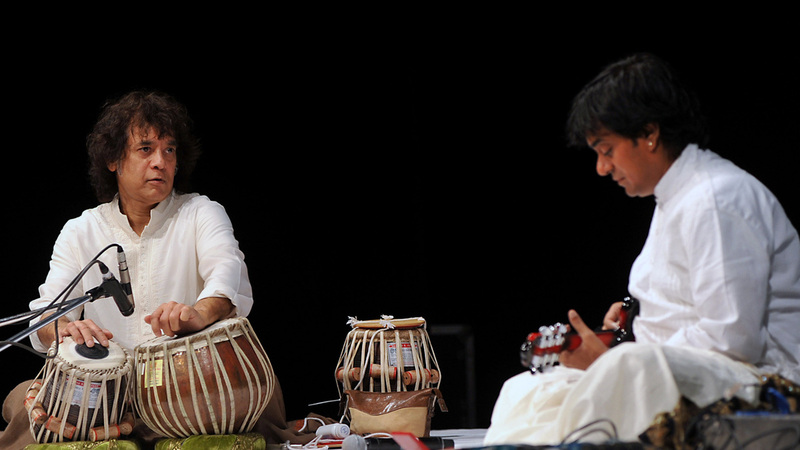 Indian tabla maestro Zakir Hussain and the late mandolin virtuoso U. Srinivas perform together in Mumbai in 2013. U. Srinivas died Sept. 19 at age 45. Mandolin maestro U. Srinivas, an astonishingly talented Indian artist who brought his Western instrument into the heart of traditional South Indian music, died Sept. 19 in Chennai at age 45. According to Indian press reports, he died of complications following a liver transplant. Known alternately as "Mandolin" Srinivas or U. Srinivas, Uppalapu Srinivas (sometimes spelled "Shrinivas") was born Feb. 28, 1969 in the southeastern Indian state of Andhra Pradesh. He brought a liquid sound to his instrument that is arguably untouched by mandolinists working in any genre. Along the way, he became one of the most globally beloved South Indian musicians. Carnatic music — music of South India that is cousin to the Hindustani (North Indian) classical music far more familiar to Western audiences — has long embraced Western instruments. Especially prominent are the violin (via players like L. Subramaniam, L. Shankar and A. Kanyakumari), the viola (M. Balamuralikrishna) and even the saxophone (Kadri Gopalnath). Guitar had also started to make inroads in Carnatic music, beginning in the 1970s with Sukumar Prasad. Bringing the mandolin into Carnatic music was still a new — and later, frequently criticized — endeavor when U. Srinivas picked it up at age 5. He saw someone play it at a concert he attended with his musician father, U. Satyanarayana, who promptly bought his son an instrument and began to teach him how to play. At first blush, the mandolin seemed like an odd choice for South Indian music. The ideal for Carnatic melodic instruments is to mimic the human voice, in what's called gayaki — singing — style. (Many instrumental performances in Carnatic music are adaptations of Hindu religious songs, rather than the long expositions of ragas typical in Hindustani music). Even as a youngster, he had an amazingly natural touch. One of the earliest LPs I encountered by Srinivas, Mandolin Ecstasy, was made when he was still a small boy yet completely belied his youth. (The Western shirt he wears on the cover is sublime.) As good as those early recordings were, they were superseded by his later international work. In the mid-1990s, he recorded two albums for Peter Gabriel's Real World label. The first was Rama Sreerama, a rapturous and entirely traditional album of Carnatic music. The second Real World album was Dream, a 1995 fusion project with guitarist Michael Brook and English violinist Nigel Kennedy. Musically, this ambient album was a world away from Rama Sreerama and Srinivas' other recordings, but the mandolinist was quick to point out in interviews that he "hadn't breached the rules and regulations of traditional music." In the ensuing years, Srinivas found fruitful collaborations that crossed both East and West as well as North and South (India) via his work with Remember Shakti, the group founded by English jazz guitarist John McLaughlin and tabla virtuoso Zakir Hussain. Remember Shakti was a revived version of the celebrated 1970s band Shakti, which included McLaughlin, Hussain, L. Shankar, the late mridangam percussionist Ramnad Raghavan, and ghatam percussionist T.H. "Vikku" Vinayakram. In its 1990s iteration, Remember Shakti's hyper-fueled core lineup was McLaughlin, Hussain, multi-percussionist V. Selvaganesh (son of "Vikku" Vinayakram) and U. Srinivas, who brought his trademark honeyed sound — and sweet, enthusiastic visage — to their joyous performances. In an interview McLaughlin gave to The Times of India Sunday, the guitarist said, "Collaborating with him was one of the greatest experiences of my life and I have played with the greatest. ... I don't know what to think any more. We've been touring for 14 years as a family with him. I don't know how Shakti can be without him. ... He was the spirit of Shakti." U. Srinivas apparently endured a number of hardships in recent years, according to Indian press reports. He and his wife, vina player U. Sree, filed for divorce in 1998, but it was only approved in court in 2012, at which point U. Sree received custody of their only child, Sai Krishna. Winner in 1998 of the Padma Shri, one of India's highest civilian awards, along with a host of other prizes, U. Srinivas often expressed his desire to make the mandolin an integral part of his beloved Carnatic music. Whether or not that eventually happens, he blazed a trail and set an irrefutable standard — and Indian music has lost a giant.